*** What if anyone could collect art? What if anyone could research artworks for sale and make an educated bid? What if a term paper combined a variety of writing experiences with applied research? That might help students see the point of doing (unwanted) research and (anxiety provoking) writing assignments. The context: In the fall of 2017 my students in a 300 level Chinese art history course at SUNY Oswego conducted a multi-component research project instead of a traditional research paper. Art History courses at SUNY Oswego serve the SUNY General Education program (in this case, World Awareness, Humanities, formerly “Non-western Civilization”) and Art Department requirements for students pursuing any one of several BA and BFA and minor degrees in art history, museum studies, studio, graphic design, web design, and interactive design. Our departmental assessment committee compiles and analyzes data for General Education, Writing Across the Disciplines, and several standards from our accrediting association, the National Association of Schools of Art and Design. Assessing student success in Writing Across the Curriculum is a priority and my colleagues and I have sought assignments that would seem practical and applicable to the students we serve. Also, in my case at least, I hoped to avoid the small but meaningful percent of papers that are unfocused, error-ridden, or plagiarized. Most important, I wanted to share with students my enthusiasm for handling original artworks! As our degree areas have been looking at learning outcomes and designing new writing assignments, the trend in many of the design programs is to require more writing that is applicable to their specific fields rather than art history research papers. In the Art History area, we also seek to offer a wider variety of writing experiences including, for example, museum labels, brochures, and grant proposals. In this course I wanted to give students experience with writing letters, proposals, and reports that were based on visual analysis, research, and an introduction to art markets, types of museums and their collecting practices and ethics, and laws regarding the collection of antiquities. Therefore, I created an assignment where students identified an object currently on auction and then had to find a comparable art work both in an established museum and also from a larger auction house, such as Sotheby’s or Christies. Through scaffolded writing assignments students could be assessed by our learning outcomes and have the satisfaction of becoming an “expert” of sorts on the object of their bidding. 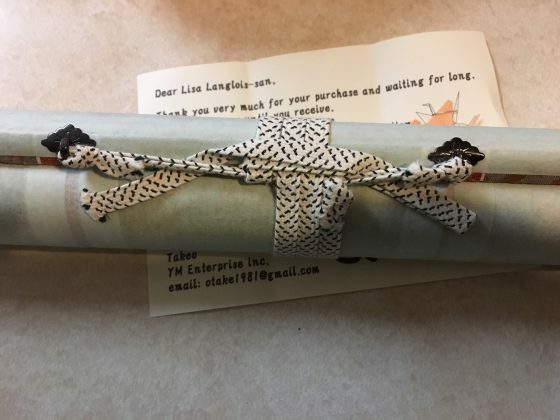 Object Lessons: I frequently bring my original artworks, and high-quality printed reproductions of famous paintings to class so that students can practice unrolling, hanging, and re-rolling scroll paintings. Since my paintings are not of great monetary value I encourage students to handle them. 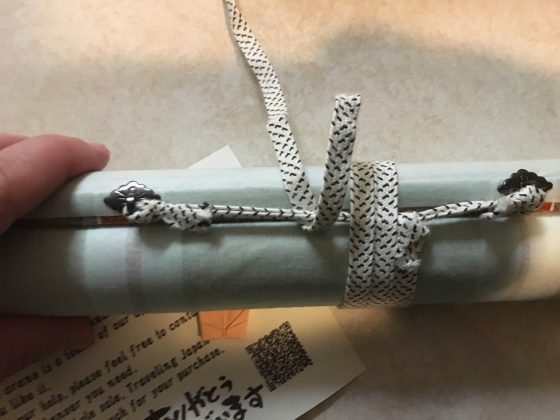 Scrolls are tied in a particular way, which is intimidating to learn at first. This summer I purchased this unusual unmounted Japanese painting for $27.00 (plus $8.00 shipping—from Japan). Being unmounted, students could see more closely the materials by examining the back of the painting. 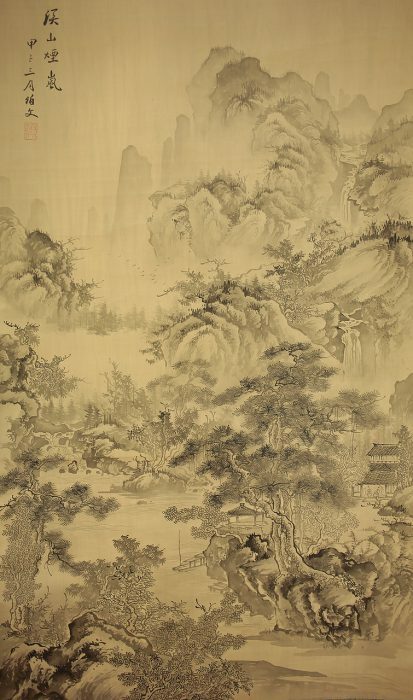 Most of my paintings are Japanese, but I bought a very special Chinese landscape painting last summer and brought it to class often to study brushwork and how to understand painting conventions, inscription styles, and how to research artists’ and collectors’ seals. In addition to conventional print dictionaries of Chinese artists’ seals, I introduced mobile apps that transformed typed Chinese characters to seven different calligraphy styles and also seal script. Even though none of my students could read Chinese, they could analyze and recognize these characters and their changes. Item Watch: The ultimate project was an exercise in which a fictive donor had asked the student, who for the assignment pretended to be an intern or curatorial assistant, had to make an argument for or against a specific museum or gallery accepting the gift. It comprised a cover letter, an accession proposal and report, an analysis of condition and price in comparison with the compared works. To succeed, students had to understand the museum’s mission, scope of collection, and audience. Reports and recommendations to accept or reject the gift had to argue for institutional fit. After selecting an item on auction, students wrote comparative analysis papers contrasting their item with similar ones in a major museum (usually the Met) and an established auction house (usually Sotheby’s or Christies) where they also found tips for collecting Chinese art. High Bidders: The strongest projects usually, although not always, arose from original works rather than mechanically or hand copied reproductions. One thing that I enjoyed most was finding out what appealed to students and why. I got to know my students better: I discovered that a painting student I had known for two years is passionate about embroidery; a graphic design major I’d taught also loves making and buying ceramics; and an international studies and business major’s mom collected and filled the family apartment with Chinese art. Students enjoyed the drama of the auction and a couple actually made purchases, though of course not required. Congratulations! You won: One student project concerned a porcelain Famille Rose cup with a complex iconographical program. The student was able to identify most elements in the design and to discuss the production of this ware in her cover letter, condition report, price analysis, and final recommendation report. 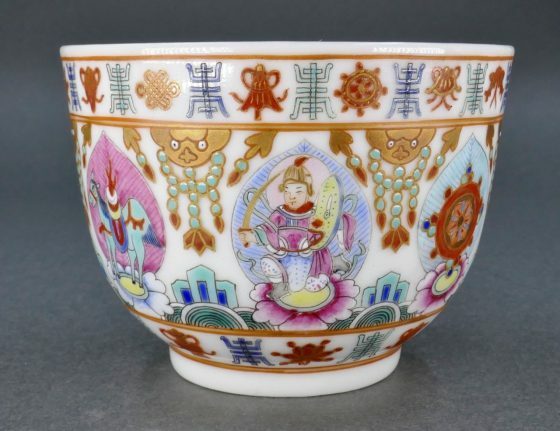 In addition to academic resources available through the library, students learned about valuable sites such as Peter Comb’s BidAmount website and weekly newsletter and YouTube video that analyzed noteworthy Chinese ceramics sold through eBay the previous week. 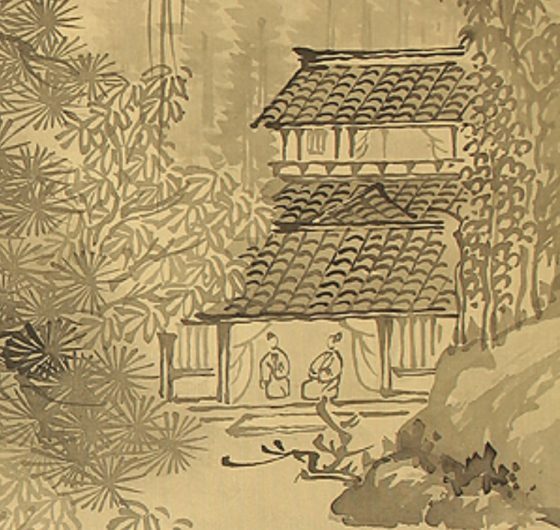 The website has numerous tutorials and references for those interested in collecting Chinese ceramics. The students were wary of beginning the project, but welcomed a change from a traditional research paper. Moreover, students who were typically anxious about writing an argumentative essay embraced the premise of writing a recommendation to a curator. Because the project comprised several steps with re-writing, the final student work was highly original and well-written. For assessment purposes, I evaluated the final step, the argumentative essay, by the criteria currently in use in our Writing Across the Discipline ASLO plan. 21 students enrolled in the course, but two dropped, and one took an incomplete. The data is based on nineteen students. Outbid (or Lessons Learned): Lessons learned include that although there are a number of useful online tools and mobile applications for rendering Chinese characters into archaic seal script or one of the five or so calligraphic styles, making it easier to confirm one’s reading of each character, students relied on my limited ability to read Chinese. In the future I would either assign this project for courses on English language content OR pre-select a very limited number of Chinese or Japanese eBay objects from which they can choose. Delivered: In conclusion, students performed better on this assignment than on past research paper assignments. I attribute this to the appeal of an applied writing project, multiple attempts to practice skills like building accurate citations, practice with formal and comparative analysis, incentives for writing clear prose, and a body of their own research from which to draw when writing their reports in support, or against, acquisition of an object from eBay. If you would like to try this assignment, please feel free to write to me for instructions, bibliography, rubrics, and useful resources on the web.